Nathan and the team are ready to hit the trail this weekend! He’s out to reclaim his Beargrease crown as the Hibbing Daily Tribune pointed out this morning! Click here to read the article. Be sure to check out the tracker on the Beargrease site to follow along with the team on the trail. Click here to be taken to the Beargrease site. A quick update on what Nathan and the team are up to now that winter finally seems to have arrived! Nathan is continuing to do fifty mile training runs. He has been clearing trails at the same time. The river isn’t quite ready to be safe to run on yet, but he has found a way to get the miles on the dogs without relying on the river. He’s been running two 10-dog teams every other day. It has been cold! It’s getting down to 25 below! The plans for the Iditarod are on track. We are still looking for sponsors, it is not too late: click here for details! We are getting the drop bags ready, they need to be shipped out next week. Nathan is cutting the dog food and will have it packaged this week and ready to ship. He is also preparing for the Beargrease! 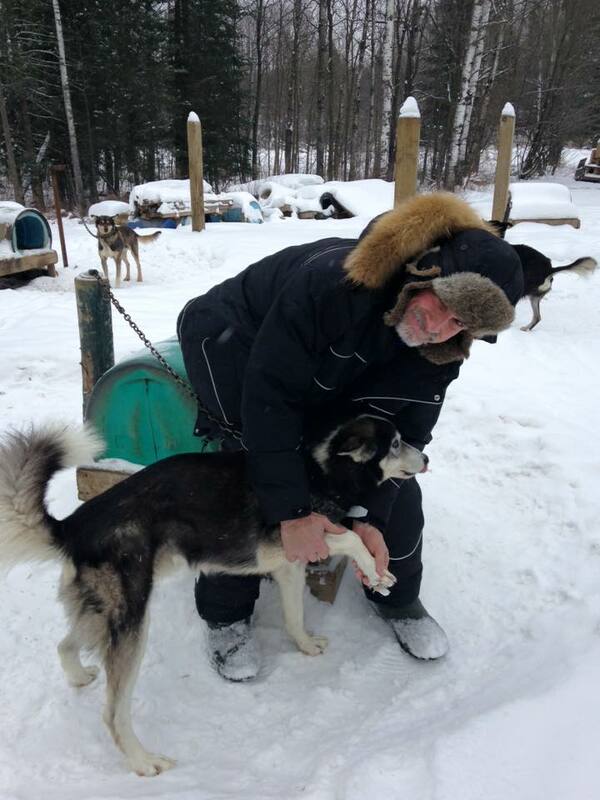 We need to get the gear packed for the musher and handlers as well as the dogs. He is looking forward to returning to the Beargrease! 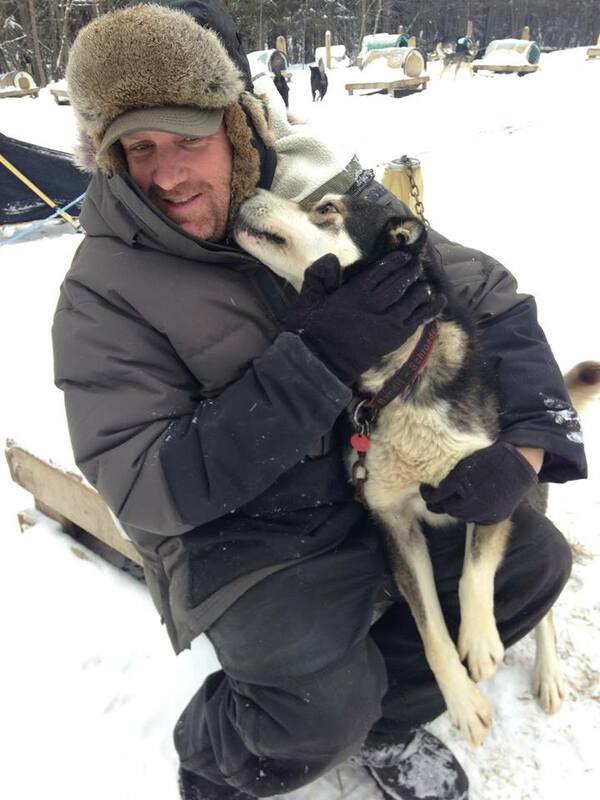 Nathan is not sure what team he is bringing yet – young dogs or veterans? There is a fund raiserJanuary 29th at the Greenmill in Duluth. Be sure to check it out as a kickoff to Beargrease that start that weekend! First snow means it’s sled time! “It was exciting to get on the sled,” Nathan said as he took out eight dogs: Sheriff, Mickey, Grizzly, Yentna, Bella, Maple, Buffy and Rohn. The river isn’t frozen safely enough and there isn’t enough time in the day to run four 8 dog teams in a day – so these eight were the lucky ones! Hopefully when the river freezes, and has been tested for safety, he can take the bigger teams for longer training runs with the sled. Once the river is thoroughly frozen, Nathan will need to use the snowmobile to test and pack a trail on the river. Once he can run the river, he will not need to cross any roads or go down logging roads. Until Mother Nature cooperates, Nathan and the team will need to continue to train with the truck. There is a bit of sad news in the kennel, Diablo has been really sore. He is ten and is needing to retire. Nathan said, “He is such an awesome dog. One of the finest dogs I have ever had.” There are only three dogs in history to run and win three times in the whole Beargrease: Madonna, Jackamo, and Diablo. All three are from Nathan’s kennel and raced with him. Diablo has earned the treat to walk around the yard, free to eat snacks. He is already wanting to come in the house, so he will be the new house dog soon! The Iditarod drop bags arrived in Warba from Alaska!!! Nathan and the whole team are preparing the gear and food to be packed and shipped to Alaska by the middle of January. Dog booties have been cleaned, sorted, and put together ready to pack. The rest of the gear is getting counted, sorted, washed, dried, cut up, and organized for packing. Thank you to everyone who is helping. Jen Reiter and her class are getting the snacks ready and everything else she does! Brett Pugsley, has been a big help in the kennel, and at the parade. Kerry Nelson is the “Den Mother” and is so helpful it is hard to list all that she does. Toni Pugsley has been a great help with the behind the scenes including fund raising and helping at the parade. Brett was here again this weekend, he was a huge help!! He cleaned the kennel, helped to feed, hook up, and run the dogs, and even switched out hay in the dog houses. He and Nathan took the dogs out for 40 miles on Saturday. Nathan and the team continue to be on an every other day running schedule. He takes all 32 dogs for 40 mile runs. He has been swapping leaders around and seeing who will work well together. The main leaders have been Donald, Mickey, Goofy, Frozen and Grizzly. They are all doing great! Of course they need to learn, and Metro, Achilles, Fillmore, Bandit, Sheriff, Miss Sally are up there showing them the ropes. Hard work and persistence will lead to winning and a successful kennel. As far the yearlings, Maple, Buffy, and Nala continue do very well! Snip and Snag are also doing great and getting more mature. Nathan think they are going to do amazing in the near future. Really, all the yearlings are doing wonderful. A big “Thank you” Duluth Trading. The gear has been helping Nathan and the team stay warm. Thank you to Minn-Alaska Transport for the shipping! Thank you for the continued support from Millwright Local 1348, Millwright Local 548, North Central States Region Council of Carpenters. Pheasants Plus has been very supportive. Nathan runs dogs on their land, and they are also sponsors! Of course, thank you to all the fans, checkpoint sponsors, dog sponsors and the “mile” sponsors. Aside from the dogs, we are getting ready for Christmas! Happy Holidays to all!